There is a recurring tendency in medieval studies to classify folklore as something external from society. This can be seen in the perceptions of the ‘Green Children’, who appeared in Woolpit in the twelfth-century. The children have consistently been rejected as a freakish contortion of medieval superstition and generous imagination. There remains little scholarly interest in what the tale reflects about the way of life of those who told it and that is what this article seeks to remedy. Initially, the appearance of two green-skinned children with no recognition of the medieval way of life presents just such an opportunity to make the unknown manifest. Yet closer examination of the actual records that detail the discovery of the children shows that these mysterious figures had much more in common with the bewildered folk who had found them than the legend would have us believe. It is an analysis of the similarities innate in the relationships between children and locals that demonstrates the capacity to alienate strange tale sand their protagonists. 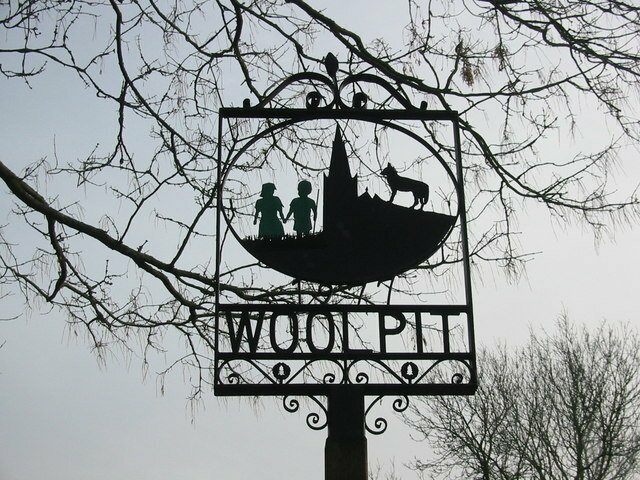 Any search for the tale of the Green children of Woolpit will inevitably turn up the wonderful answers that have been suggested over the years. These include travellers from another dimension, mysterious creatures that dwelt beneath the earth’s surface and, of course, aliens. This is unsurprising, as the descriptions that we possess seem calculated to ensure that these conclusions are reached and even seen as the only probable explanations. Everything about how the children are described removes them from the realm of the accepted and depicts them as living objects from territory unknown. What is often overlooked – subconsciously or otherwise – is the basic reality that these were two children who for whatever reason, became detached from their home and were left at the intrigue of those who found them. It is important to return to the state of affairs in the mid twelfth-century Suffolk, in a village named ‘St Mary of the Wolf-pits’. The chronicler Ralph of Coggeshall details the finding by the locals of a brother and sister, indistinguishable from others save that ‘the whole surface of their skin was tinged in a green colour’. Their speech was incomprehensible to the English ear and it was to get even stranger when the children were brought to the home of a regional knight, a certain Sir Richard De Calne. Here they wept bitterly when bread and other foods were offered unto them and refused to eat until they were given peas within beanstalks, which they took with great veracity. Despite the nutritious power of the peas, the boy died a short time after their discovery, whereas the girl went on to receive a baptism in to the church and retained a position in the household of the knight. This first part of the tale recounts the location of these two siblings in a manner that presents them as totally incompatible with human society as well as going one step further and deploring their unfamiliarity with basic natural requirements such as the eating process and their irregular skin tone. What is quietly forgotten is the fact that these individuals recognised that they were brother and sister and how this dynamic featured in the family structure. It also fails to address that the girl was able to learn the English language as well as the significance of baptism and the nature of working in a household. By taking these into account, it is possible to suggest that these children are not aliens nor have they emerged from a subterranean society because their physiologies are identical to that of the English. Additionally, the understanding of the girl with regards to the baptism and her servitude in the knight’s household demonstrate that she has a knowledge of the religious and societal hierarchies in place as well as the concept of service in exchange for sustenance. The result of a wider investigation of the implications of what Ralph describes reveals that these children obviously had a grounding in Northern European culture. The theme of creating difference is continued throughout the remaining discussion of the children by Ralph of Coggeshall, who continues to inform us that when the girl was asked about her native land, she replied that she and her brother had been tending to their flocks, they came across a cavern and ‘on entering which they heard a delightful ringing of bells’. Furthermore, after a considerable period wandering in the cavern they emerged in Woolpit and remained there, fearful of the sun and unfamiliar temperature until their capture. Again, the ostracization of the siblings is taking place by the description of a journey from a strange land through a portal to a strange conclusion which emphasises their incompatibility with the English landscape, familiar to those hearing this tale. An analysis of the second part of the tale, including what is inferred but not overtly mentioned by the author, it is possible to discern a more comprehensive view of the children and their backgrounds. The children were tending their ‘flocks’; implying that they had a knowledge of pastoral farming and that wherever they were from, this process existed in the same way and required the same effort and environment that it did in England. The image that is produced from investigating the words behind the Woolpit children is that they hailed from a European background, had a reverence for the Christian church and subsisted through farming livestock. It might be argued that they had travelled from Northern Europe on a trade ship and became disoriented in a foreign land. This would explain the language barrier they endured as well as their familiarity with aspects of English culture that were also to be found on the mainland. The green skin may also be attributed to a condition undiagnosed at the time that was contingent upon their diet and lack of certain vitamins, either from their voyage or predating it. Whatever their origins, be they mundane or otherwise, the Green children of Woolpit remain an enigma that maintains the capacity to fascinate and invite speculation. They refuse to fit comfortably into what medieval communities considered normal and what we today consider as applicable to that period. Because of this, they have endured as a folklore tale and have been dismissed as such. The green skinned children can therefore be said to serve as much as an exciting piece of folklore as a cautionary tale in history and perspective. Wild speculation and its conclusions can be lasting and at times fatal, what became of these children, or how they came to England is not known. What is know is that they spent the rest of their lives unable to properly communicate what happened to them and receive little to no concrete help in being returned to their community.